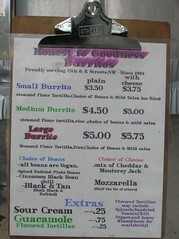 Note to readers: Do not fault your Lead Burrito Analyst for never trying Pedro & Vinny's Burrito Cart. 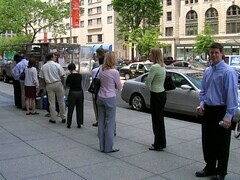 Although the cart has been serving Washington since 1994, it is only open during the lunch rush for downtown offices building. This entry was written by Burrito Chris. 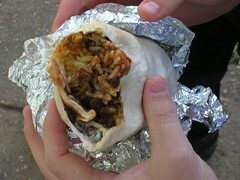 A couple weeks ago, Big Mike returned to Washington DC, and he and Burrito Chris headed down to "The Burrito Cart." Big Mike was skeptical at the prospect of a burrito with no meat, but he was to be pleasantly surprised. Chris went with the medium size black and tan (both types of beans) with guacamole. Big Mike went with the large black and tan with sour cream and cheese. All the ingredients are well distributed throughout the burrito and the beans are amazing. Apparently the black beans are spiced with cinnamon, or at least that’s what the menu says. Either way they are incredible. The quantity is just as good as the quality. A full Big Mike had to endure a 3 hour meeting following this meal and Burrito Chris reports that work productivity fell during the ensuing digestion time. Was it worth it? Yes, it was. This Pedro & Vinny's meal was rated: 7.5. 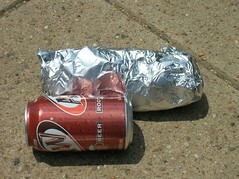 As your lead burrito analyst has pointed out, it’s hard to find a good Burrito in Washington DC. That search has brought this junior burrito analyst to 15th and K, NW (Map) to what most K Streeters call "The Burrito Cart." In fact, its called Pedro and Vinny’s (he even has a website), but it's really just one cart, one man, a whole lot of hot sauces, and one mean veggie burrito. The line moves rapidly, just make sure you know how to order. There are five tortillas, three sizes and either black beans or spiced refried pintos, plus salsa, guacamole and sour cream - medium and large sizes come with rice. You will be moved swiftly, but kindly, so be ready. As you wait, enjoy free chips with the dozens of hot sauces to try. Then choose your favorites to put on and your burrito will be made right under your nose. Photograph of Mike taken by camera shy Chris, the author of this entry.